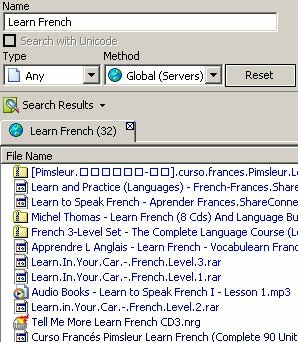 This list of steps can apply researching most all languages. Podcasts rule, but you need to download itunes to open these links. Google: "Learn X", "learn X free", "x grammer", "site:wikibooks.org x","site:about.com x"
Translate: Babel fish serves as a multilingual translator. Google toolbar has an option that will translate words by hovering over them. Watch Videos: Check the list of domain extensions corresponding to the country. Go to google video and replace the .com with the domain extension. For example here's google video france. Emulation basically makes playing consol games possible on your computer. Read more about it on Wikipedia. Playing games can help me learn a languages? In respect to reading and grammar, absolutely. The old role playing games of the past are completely text dependent. Super nintendo games are mostly targetted because they are of small file size and there are many fan sites like emuverse and Snakeyes that offer translation patches in multiple languages for any game. Awesome titles include Super Mario RPG, Chrono Trigger, Secret of Mana 3, Star Ocean, Tales of Phantasia, Breath of Fire 1 and 2, Romance of the Three Kindgoms, Final Fantasy 2 - 5. Final Fantasy Tactics Advanced (EU) for GBA and Zelda: Majora's Mask for N64 are among many exceptions of other consols that have multilingual games. Beware of peer to peer networks. They can offer some great stuff but you have to check copyrights before you download anything because many of the programs may be illegally redistributed. For more about p2p networks check out my best peer to peer networks article.